Not recommended for new designs. Please contact Linx Sales or Customer Service for further details related to this notice. 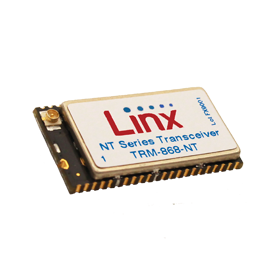 The NT Series is an FM transceiver module family that is designed for bi-directional wireless data transfer. The 868MHz version is suitable for European operation and the 900MHz version is suitable for North and South America. The modules have exceptional sensitivity, giving them outstanding range of up to 3,000 feet (914 meters, line of sight). Current consumption and low power states are optimized for battery-powered devices. The FM transceiver modules have two interfaces that can be used for the wireless data transfer. The first uses a standard Universal Asynchronous Receiver Transmitter (UART) with a very simple built-in protocol that supports data rates of up to 56kbps. The other interface is a transparent interface that bypasses the protocol engine and directly modulates the RF carrier. This interface supports data rates of up to 300kbps. The basic configuration settings are done in hardware through the logic state of several pins on the module. Optionally the UART interface can be used for software configuration, also giving access to additional advanced features. For example, eight RF channels are selectable by the logic state of three lines and the full 101 channels are available through the UART interface. The modules are capable of generating +12.5dBm into a 50-ohm load and achieve an outstanding typical sensitivity of −111dBm. Housed in a compact reflow-compatible SMD package, the transceivers require no external RF components except an antenna, which greatly simplifies integration and lowers assembly costs.